Sometimes it’s not just what you learn at college. Sometimes it’s all about where you learn it. As communities, college campuses can be unique — personalized by geography, region, climate, affiliations and traditions. Very often it’s the community the college serves that can distinguish an institution’s identity. “Some names matter — and Boston matters,” explains Steve Turco, General Manager of the Barnes & Noble at Boston University bookstore. “The people who live in Boston have a strong passion and identification for being Bostonian, and they’re prideful of their city and the teams and schools who represent them,” he adds. That sense of identity with a city can sometimes come from something as big as a winning football team or as small as a college logo, but in the case of Boston University, it required nothing less than a step back in time. That kind of out-of-the-box thinking is typical of the way the bookstore and the campus work together, as Kenneth Elmore, Dean of Students at Boston University explains. “I have found working with Barnes & Noble here at Boston University to be a great experience, a really creative experience, and one where there’s some good back and forth — where we challenge and surprise each other at the same time,” he says. Working closely with the campus licensing director and the athletics department, the group began to search out logos from the past that would resonate with the 21st century consumer. In that search, the team was given access to old yearbooks and old sorority and fraternity publications, some dating back over 100 years. Webb Lancaster, Director of Operations, Auxiliary Services at Boston University was also involved in that mission. “We went through all those yearbooks, old mascots and all these old images on varsity sweaters and crew uniforms and found some really cool stuff,” he recalls. In the process, they also unearthed a rich and fascinating history of the University’s brand. In some cases the iconic Boston terrier was shown as friendly, in others fierce, and some logos were fully realized while others looked more like pencil drawings. Different organizations and groups had taken some liberties with the brand over the years and logos changed. Even the fonts had changed to reflect the fashions of the time. “In some cases we were working in climate controlled environments with white gloves, in others, we found some amazing materials just sitting in file cabinets in manila folders,” Turco says. From thousands of different designs, the next challenge was to get the unique and iconic images into a digital format and translate that to a graphic on a garment. Turco credits his vendors for representing those brands faithfully and attending to details as specific as hang tags for the products, so they were strikingly displayed in the store. Barnes & Noble at Boston University General Manager Steve Turco sits in front of a display of one of the vintage logo t-shirts in the bookstore he manages. 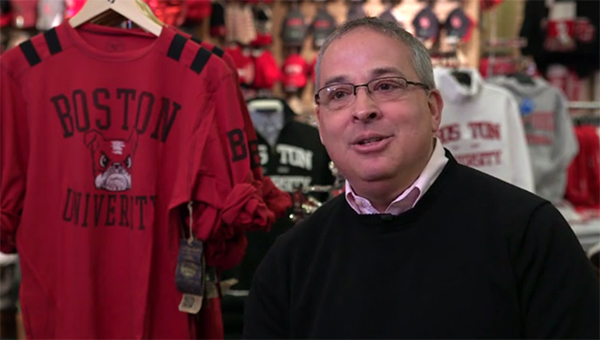 Whether it’s working with students on their course material options or developing unique campus merchandise, Turco and his colleagues at Boston University are continually looking for new ways to support the University’s goals and ambitions. Because just as every campus is different, so too is the individuality that goes into every campus bookstore.